A big thank you to organisers, officials and all those present who helped to make our tournament a great event for all the children. Our aim in Mini-Basketball organiser is to create a National u11 celebration tournament which promotes the values of friendship, fun, respect & fair play. I think we achieved most of these aims especially with the children. 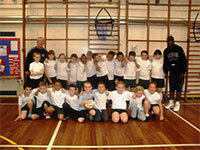 The children all demonstrated great sporting attitudes,determination and basketball skill. We could tell from their response at the presentations that they all had a thoroughly enjoyable experience. Paul Sturgess and Mark Waters will visit you for the day to deliver fun basketball sessions that will get the whole school active and having fun. Paul is a former Harlem Globetrotter and at 7 feet 8 inches is the world's tallest professional basketball player. Since 2014, Paul and Mark have been visiting schools throughout the UK, inspiring children through their WOW DAYS. The day begins with an assembly, which includes the themes: 'A Healthy Lifestyle' - encouraging children to be active and eat well 'Discovering Your Talents' - inspiring children to discover their talents and work hard to realise their potential. For more information on Paul, Mark and the WOW DAY please see attached. To book or discuss a visit further please call 07958742248. Mini-Basketball England announces an exciting new partnership with Bishop Sports and Leisure to promote Mini Basketball and Take 6. 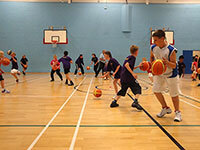 Bishop Sports and Leisure, a leading specialist schools sports equipment supplier will be presenting in their new season catalogue a specially selected package of equipment for primary schools who wish to introduce mini-basketball into their curriculum or as an extra curricular club. The equipment package will include all you need to introduce Take Six Mini-Basketball. Teachers can also download the Take Six rules in the Take Six section of this website. Dennis Katungy Mini-Basketball Coach and a Ugandan secondary school teacher runs a Mini-Basketball Club called Extreme Kids for local children during the school holidays. The aims of the holiday club are to give the local children a positive sporting experience and encourage attendance & commitment to school work. Dennis visited a private school in Abingdon in late September. The school has undertaken some exchange work with Dennis’s secondary school. 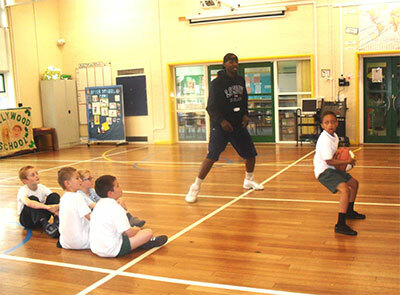 Dennis also wanted to make contact with a primary school in England to establish 'e' friends for the Mini-Basketball Club children so a day was set up at Hollywood Primary School, Solihull near Birmingham. Martin Ryan, the PE Teacher at Hollywood has been involved in developing the South Birmingham Take Six Mini-Basketball programme and was keen to take up the project. We had a great day at the school visiting classes and meeting the headteacher and staff who wanted to help the project along. Dennis had brought along for the school individual child profiles with photos with the idea of matching up with similar aged children. The 'e' contact would be via email and also a Blog. The e mails would be sent through the school email to start with. At the end of the afternoon we ran a Mini-Basketball Club session for about 20 children with Dennis helping to demonstrate. Dennis has now returned to Uganda very pleased with his visit and in the knowledge that a school had been found to support the project. Eight Regional girl's teams and 9 regional boys' teams played at the first National Mini-Basketball Tournaments staged especially for u11 boys & girls representative teams. 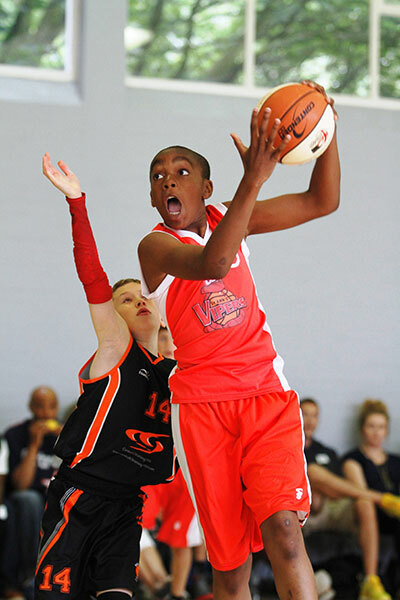 "The standard of play was the highest I have experienced in Mini-Basketball in England. I have attended many European Mini-Basketball Tournaments & Jamborees over a long period. When I compare, at last I think we could be now matching the high standard of play of Mini-Basketball in mainland Europe. We were also really delighted that all the players, nearly every coach and 99% of the spectators followed our Code of Conduct." There was some passionate support and it was suggested there was a better atmosphere than some senior national league games. One parent commented: "I wish all this positive energy could be bottled!" Many thank all the organisers, officials and volunteers for giving their time to ensure the success of the tournaments. The Guidelines for County, Regional & National Tournaments 2013 are now available to download. If you would like to be involved in this exciting National programme please contact Martin Spencer. 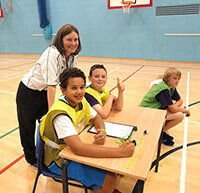 Mini-Basketball England will be recruiting Mini-Basketball Volunteers to help at the Regional and National Tournaments. This is an ideal opportunity for young adults who have undertaken leadership training to gain valuable experience. Please download the role description. 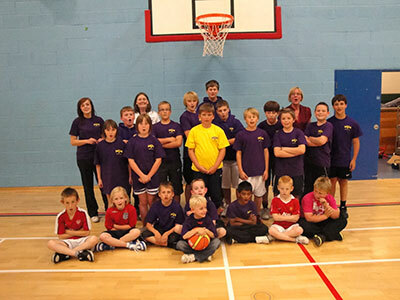 Duston Hawks are a community club, aiming to provide basketball for children of all abilities between the ages of 7-18 years. The club was established in September 2009 through links with The Duston School to create a club where young people can play, receive high quality coaching and improve all in their local area. The inspiration for the club came from its founder, Karen Risk, School Sports Coordinator and secondary PE teacher at The Duston School. 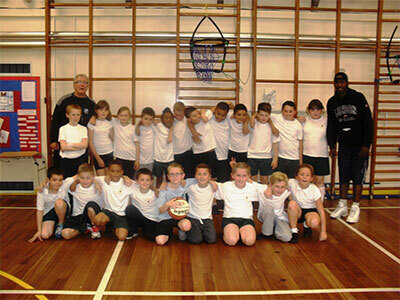 Having the opportunity to work with the primary children at Northampton Schools Partnership Take 6 Mini- Basketball and multi-sports events she could see the enthusiasm children had for the game. Always looking for school to club links in a variety of sports it turned out there was no club to link to in the locality. With a help from start up grants from Sport Unlimited, Get Sporty and School Sports Coaching Fund a club was started at the secondary school, which benefits from 8 adjustable baskets. There had not been a strong history of basketball at the school so it initially proved difficult to recruit enough interested students to play. The competitive opportunities to play locally also seemed few and far between. We invited children of primary age to a 4.30-5.30pm time slot (a time the facilities were unused anyway) and secondary children to a 5.30-7pm slot (allowing players from other schools time to travel to us). We now have a healthy number of players of all ages with young leaders form the older group regularly helping out with the younger ones. There is a Central Venue League organised by Tony Stewart, the Northants Basketball Development Officer, once a month for each age group on a Saturday which now gives a range of appropriate competition for all abilities and ages. By the end of our first year, grants ran out but numbers had risen sufficiently to enable the club to be financially self sufficient with a small charge of £2 per session to all players and a bit of healthy fund raising by parents at the summer fete. 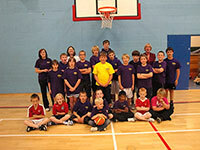 To date The Duston School have kindly allowed us access to use their balls and basketball kit. We aim to be able to raise funds to get our own next season. We were also fortunate to have access to the Northamptonshire Sport Coaching Agency that provided us with some really inspirational coaches. The club has just been awarded a 2 star accredited club award from England Basketball The future of the club is very exciting with parents and players taking on responsibilities to move ahead; going on courses and being active on the committee. What we also really want is for similar clubs to start up in Northampton so the network or basketball family grows. Amber started basketball by playing mini-basketball. She represented England at a European Mini-Basketball Jamboree in Sicily with a party of 5 boys and 5 girls of primary school age. 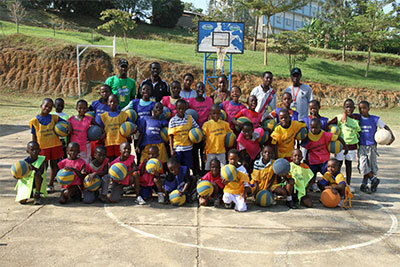 At the Jamboree the children were placed in mixed teams from all 8 participating countries. The event also included other sports and cultural activities. Amber was a young ambassador as part of the London Olympic bid. Amber played her mini-basketball and basketball at the famous Youngbloods Club in London. She is now playing at college in Tennessee. The Lady Crusaders moved to a 7-14 record after defeating Toccoa Falls Eagles last night. The Lady Crusader were in the lead going into half-time with a score of 31-24. They maintained the lead till the end of the game, finishing strong with a final score of 66-42. The night saw a balanced effort from all the players. 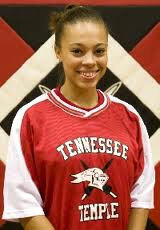 Tennessee Temple's Amber Charles led the Crusaders to the win with a 14 point performance. 6 rebounds and 6 steals.